More condensation can be seen at the drain pan. At the same time, the room is no longer cool. This means that it is time to investigate the causes of this problem. Here are some possible causes. 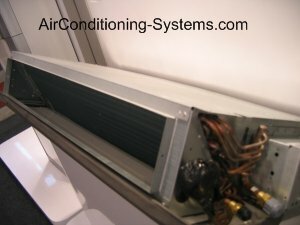 When air flow or air circulation from the unit to the room and vice versa is restricted, the exhange of thermal energy between the air conditioner and the room is restricted. As a result, most of the cool air continues to stay around the evaporator coil and fins causing the temperature around them to drop. As a result, ice is formed and gradually more ice began to built up and eventually causes the air conditioner freezes up. Air Filters at the return air of the equipment must be serviced regularly by taking them down and wash with water and soap. These filters are used to trap dust and other bigger contaminants from going into the evaporator fins. Hence, cleaning them at least one or twice a month is highly recommended. In many cases, users will not even clean them once a year until this problem begin to surface. Evaporator coil and fins that are located after the air filters can also be clogged up due to dirty filters. In this case, you will need to clean them by using a spray type coil cleaner. The other alternative is to get the technicians to come and take down the entire evaporator for cleaning. This will be more costly. Therefore, regular maintenance of the evaporator coil and air filters will go a long way in ensuring that your air conditioner continues to function properly. Fan or blower at the evaporator unit may not be functioning. When the unit is on, check that there is air flow coming out of the equipment. Otherwise, the fan may be damaged. In this case, the fan motor may have burnt or some loose connections may have occurred. Get a technician to check if this is the case. Check that there is no blockage of air around the evaporator by ensuring that things are not placed too near to the evaporator. One other step you can do is to check the set temperature of the air conditioner. Make sure that it is not set lower than 70 °F. When the refrigerant in the system is low due to leakage over time, there will be a decrease in the saturation point temperature of the system. When this happens, it will take a lower temperature for all the refrigerant liquid that has been compressed by the compressor to become vapor in the evaporator. This means that the operating temperature of the cooling coils has now dropped compared to the original design. This lower temperature will cause moisture collected from the air to quickly becomes ice on the evaporator when the temperature goes below below 32 °F. These moisture that is supposed be cooled to a level which becomes water and drips to the condensate drainage pan is now stuck at the evaporator coils and fins forming ice around them. When this continues on, eventually a block of ice is formed on it. When you see the ice being formed on the evaporator, off the unit and wait for the ice to melt. It could take a few hours for all the ice to melt. A faster way is to on the air conditioner but using Fan mode. That means, only the fan is operating but the compressor is off. This will reduce the melting time of the ice but you will need to be around to monitor it as water may overflow and cause damage to your furniture or electrical items. A low refrigerant problem can only be solved by a qualified HVAC technician as additional refrigerant will have to be added to the system. Another possible cause is when you are operating your air conditioner when the outdoor temperature outside the house is low. When this happens, try to run the air conditioner using fan mode or simply use the outside air to ventilate your room. For such equipment to operate, one way is for manufacturer to install a fan speed controller to regulate the speed of the condenser.